The 2000R Range of hand-hand relative humidity instruments has been designed for the effective and reliable measurement of controlled environments. The two models 2020R and 2080R offer excellent accuracy at a budget price. Their ergonomic case design with advanced technology sensors combine to give instruments with excellent performance and long life. 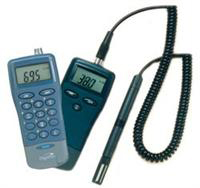 The more advanced instrument 2080R includes functions such as - Dewpoint calculation, separate thermocouple input and logging and can measure humidity to 1.5% RH accuracy. The DRT 880 is low cost,desk/wall mounted instrument with a clear digital display of humidity and temperature.